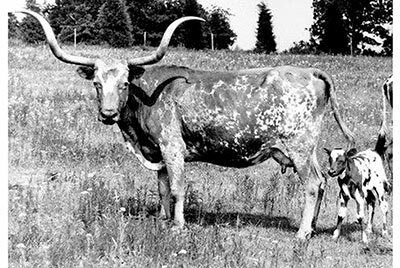 WR 1052 ~ The very top cattle in the breed during the sixties and seventies were thought to be from the Wichita Refuge (WR) herd. It was the herd most touted in TLBAA histWR 1052 ~ The very top cattle in the breed during the sixties and seventies were thought to be from the Wichita Refuge (WR) herd. It was the herd most touted in TLBAA historic materials, the only herd with an annual auction, with pastures and corrals the envy of the industry. The WR herd ran about 150 cows and 30 breeding age bulls plus the largest exhibition steer herd in the nation. The WR cattle were very line bred. The type was "fixed" with very little variation. Most WR cattle during the early eighties had common ancestors of less than 15 animals clear back to the early thirties when the herd started. It was the youngest herd of the 7 families; the other 6 herds started before 1930. Most TL producers had herds of over 90% WR blood. The only source of genetics was to go to the annual WR sale. Other herds were out there, but there was very little promotion or recognition. The queens from the WR herd were WR 1005, WR 1850, WR 1052 and lastly Measles 2849. Seldom are there any registered TL cattle that do not trace back to one or more of these early famous cows. If you had a bull from one of these or if they appeared in your pedigrees, you were considered a knowledgeable TL producer. You had it figured out. Although these 3 numbered cows were measured above 50" and possibly over 60" in their later life most WR bulls that were bred to them sported 28 to 32" horn T2T. It was a locked-in genetic thing almost impossible to blast out of the DNA to create a mutation variable. As a result, the very best of the WR cows had calves mostly on the herd average for T2T. WR 1005 and her son WR 2308 were discussed earlier. Measles was discussed and now WR 1052. As many as 30% of registered cattle may trace back to WR 1052. She was dam of WR 1839 who single handedly raised the Fort Niobrara herd in Valentine, Nebraska up to a higher level. WR 1052 was bred by WR to the bull WR 1932 who was about 28" T2T and produced WR 2161. WR 2161 was an originator of the measles colored, late speckling genetics sought after today. He sired lacy faced or shield faced cattle adding appeal value. Some of this came from WR 1052. WR 2161 was a slightly larger horned bull than his sire, at 32" T2T. WR 1052 was about 800 lbs and appeared in photos to have very large horns because of her small size. This was a normal size for WR cows. Two successes of WR 1052 genetics were the massive lifetime contributions of WR 1839 and Measles who was a daughter of WR 2161. Both contributions were entirely after leaving the WR herd. Elvin Blevins bought WR 1052 when she was sold by WR at age 15. I wanted her but she was real nervous and that did not seem to bother Elvin. Ed Roberts the famous CEO of the American Paint Horse Assn, and honorary member of ITLA, acquired the last WR 1052 daughter from Elvin and raised a set of cattle from the WR 1052 family. Today WR 1052 traces back in the ancestry of many top registered TL cattle including Sarasam, Boomerang, Delta Van Horn, Horseshoe J Example, Jamakizm, Drag Iron, Rim Rock, Temper Tantrum, Over Kill, Rio Catchit, Jet Jockey, Super Bowl and Winchester.oric materials, the only herd with an annual auction, with pastures and corrals the envy of the industry. The WR herd ran about 150 cows and 30 breeding age bulls plus the largest exhibition steer herd in the nation. Today WR 1052 traces back in the ancestry of many top registered TL cattle including Sarasam, Boomerang, Delta Van Horn, Horseshoe J Example, Jamakizm, Drag Iron, Rim Rock, Temper Tantrum, Over Kill, Rio Catchit, Jet Jockey, Super Bowl and Winchester.